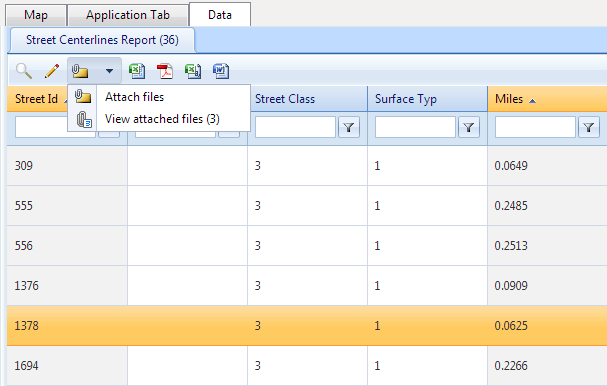 The Feature Details panel shows results from searches and selected map features that have data definitions. Note that each layer can have multiple data definitions, which can result in different result sets for the same feature type (as shown below). Additionally, the results panel has a slightly different appearance depending on whether or not a single record is shown or multiple records are shown. This shows the data definition name used to generate the result, including the number of records in that set in parenthesis. 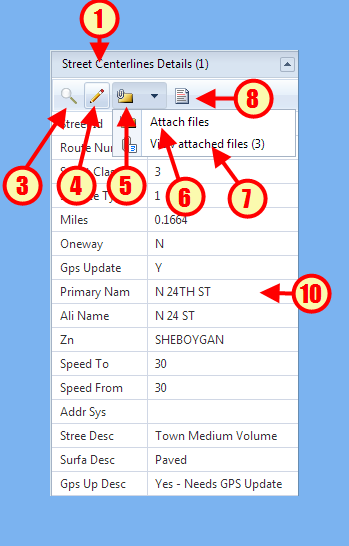 Clicking this button allows the viewing of different set of results (shown as "Water Mains Details" and "Buildings Details" in the multiple record result image, above) by expanding that set and collapsing all others. This button has no effect on single record results. Clicking this button zooms to feature(s) on the map. For multiple record results, this function zooms to all of the records in the set. Clicking this dropdown will show the buttons "Attach files" and "View attached files". The ability to view or attach files to features has to be enabled by configuration; if disabled, this dropdown will not be available. When displaying a multiple record result, clicking on this icon will expand/collapse the details for that record. This icon is not available for single record results. When displaying a multiple record result, clicking on the row of a record will zoom to that specific feature. This function is not available for single record results. Additionally, the default behavior for clicking on the row can be changed, so results may vary.